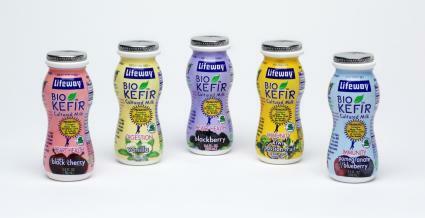 BioKefir, a yogurt "shot" from Lifeway, is a healthy addition to anyone's diet. These smooth, low-calorie drinks have lots of health claims, but only a review can tell you whether they are right for your palate. As a busy mom who is looking for easy ways to add nutrition to my life, I found them easy to fit into my normal diet. BioKefir provided one four-pack of each flavor of their drinks for my honest review at no charge. Each BioKefir shot is 3.5 ounces and only 60 calories. I was very happy to find they won't derail my daily calorie count. Additionally, being made with Agave Nectar made this mom happy, as I am trying to watch my sugar intake along with my family's total sugar consumption. Before I started drinking BioKefir, I reviewed the nutritional information to find out exactly what benefits I would be receiving from them. Kefir is fermented milk containing healthy properties that can aid digestion and has a number of healthy probiotics. This sounded like a good way to keep my digestion system running smoothly, as I am not too keen on many yogurts. BioKefir comes in convenient four packs. The small size of the bottle makes them easy to toss into your lunch bag or purse for eating on-the-go. All four kefir drinks have a smooth texture. Unlike many yogurts that also contain probiotics, the BioKefir drinks do not have small fruit chunks in them. I personally find the fruit bits in traditional yogurts a "texture turn-off," making the BioKefir drinks appealing to me. Blackberry tastes almost exactly like actual blackberries. I was very happily surprised to find out the flavor was true-to-life, since many flavored foods have a somewhat "fake" taste to them. It has a lavender hue and it does not overwhelm the taste buds. Black cherry has a pleasant, slightly sweet taste. It has a pinkish-lavender hue and is probably the most mild of all the flavors. The mild flavor was a bonus, as I do not typically care for black cherry flavored food and drinks. However, this one was gentle enough on my palate that I think others who tend to dislike black cherry may also find it pleasing. Pomegranate/blueberry tastes the sweetest, and was the one I enjoyed the most. I believe it is likely the flavor that will appeal to children's taste buds the most too, due to the sweet flavor. The blueberry flavor seems to take center stage, with a hint of pomegranate for an additional flavor layer. It is a pale blue-purple shade. Vanilla is a cream-colored drink with a mild flavor of vanilla, perfect for the person who does not enjoy fruit-flavored food and drink. I thought it would be a good base for a smoothie in the morning or afternoon. The small size of BioKefir means you can easily drink them on the run, but do not mistake them for a meal replacement shake. They will help satisfy your hunger for a while, as a snack. They worked best for me when I combined them with something of a little more sustenance, like a handful of almonds or a cup of carrots. BioKefir products are available at grocery stores nationwide. Sign up for monthly coupons on the BioKefir website to make them an affordable addition to your diet. Thank you to Lifeway for the courtesy samples of their products.